I saw this gentleman operating his ride at a carnival last month by turning it on/off via the circuit breaker on the uncovered panel. For some reason he chose not to put it down. Each time I tried to take this picture the ride "pods" kept getting in the way, but I finally got it. I used a photo editor to blot out his face to protect his identity. Carnivals will never cease to be carnivals, will they? If I remember correctly: 2 Ohio Inspectors were indicted earlier this year and criminally charged involving the death of a young man who was electrocuted when he touched an improperly grounded ride that they had supposedly inspected. My friend's church almost didn't have a carnival this year. The City asked for an employee list as a condition of the permit. About 70% of the people on the list ended up wanted/having outstanding warrants, and the cops came and hauled 'em right off to the Pokey. This is an all-too-common problem. 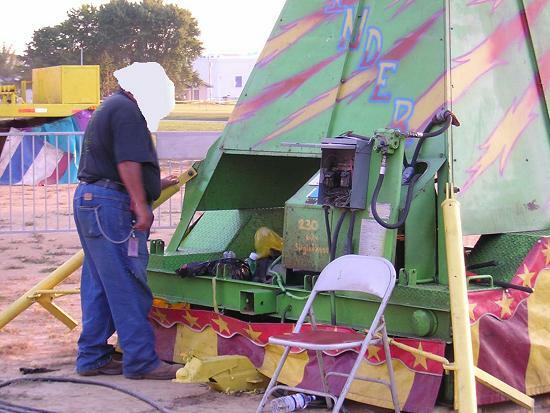 many carnivals have poorly maintained electrical equipment. I've seen much deteriorated wiring and cords, broken cord and plug conns., GEC connections to ground rod that can be moved/removed with your little finger. At one carnival in a city park, I was the city inspector assigned. One ride had conductors were so weathered that the insulation was cracked and chipping off. I got 20 v. or so from the ride frame to ground. SO I told the carnival operator to shut it down and disconnect. He said that the state inspector (CA) was just there and cerified it. So I told him to shut down the generator because it powered hazardous electrical. The ride or the power, what's it going to be? He chose the ride. We passed the word to CIty Fire & they made sure the ride was off all weekend. To be fair, I've seen carnival ride companies that do a good job, & maintain their eq., but it's not the majority. My kids don't do carnival rides!! !